I wonder whether the Zetas would care to comment on the following alleged attempts to "seed" into commercial applications, alleged extraterrestrial "probes". Supposedly called the "Caret Program, the depicted "crafts" have allegedly been sighted by the public on more than one occasion. [and from another] http://isaaccaret.fortunecity.com/ Here is the brief introduction. "I'm using the alias Isaac, and used to work in what was called the CARET program in the 80's. During my time there, I worked with a lot of the technology that is clearly at work in the recent drone/strange craft sightings, most notably the "language" and diagrams seen on the underside of each craft. What follows is a lengthy letter about who I am, what I know, and what these sightings are (probably) all about. The appearance of these photos has convinced me to release at least some of the numerous photographs and photocopied documents I still possess some 20 years later that can explain a great deal about these sightings. On this site you will find some of these." The human establishment has never stopped trying to counter the message the alien presence brings to mankind. The religious elite resents that their message that mankind was created in God's image is countered. Then what are these odd creatures emerging from space ships? Robots? Mutated humans? Demons? The message that man is alone in the Universe as an intelligent creature is also proven false, as the visitors are obviously more technologically advanced than mankind. Another group threatened by the alien presence are the military, primarily the US military. Virtually worshiped around the world by their might and size, equivalent to the combined military might of all other countries combined, they find themselves the fool when trying to chase or capture alien ships. When given craft as a ploy by Service-to-Self aliens, they again were played for fools as they could never get them to work. As we have explained, the stealth plane, a triangular shaped plane, was developed again on a ploy by the Service-to-Self aliens, who had the US military convinced the shape could evade radar. Continually embarrassed by their decades of a cover-up over the alien presence, and speachless at what to say now that mass sightings are so commonplace as to barely cause a stir, the US military is not ready to give up their primary excuse for UFOs. They are manmade, is their cry, and they set about to prove this by all manner of disinformation campaigns. Anyone who believes a word of it is a fool. No alien technology has been given to mankind by aliens. And the ability to hover without propulsion, to disappear into another dimension, or to zoom off an incredible speeds are not in man's technological grab bag. Is there a timeline when we will receive help after the PS from the Zeta's and the hybrids and other races. If human and hybrids mate how will this happen, test tube or the old fashion way. [and from another] How can STO who are more advanced than us with the power to "help" just sit back and let things happen with the shift and all? I had a very vivid dream years ago that was all these boxes floating down, everybody was afraid and standing outside on their porches and streets looking up, everybody was scared. The boxes started opening up. Perhaps they were lifeboats come to rescue us, I've thought on this often, and can not imagine myself, if I was an advanced alien race just sitting by and watching. Can you ask them why they would? Also, can you explain the mindset behind people that look forward to the shift, who talk about it like a good thing? With most of the population killed, and so much suffering to come, I can not get excited about this. As we have endlessly explained, the pole shift is nothing more than what mankind deals with now, but on a larger scale. The pole shift will be magnitude 9 earthquakes, worldwide. But does the world not experience magnitude 9 quakes now? They did so just recently in Japan! What about tsunami, a sudden tide rushing over the land, hundreds of feet high or certainly high enough and with enough force to scour the land clear. This not only happened during the Japan quake, but also during the Sumatra tsunami quake in December of 2004. Starvation? Sub-Sahara Africa, N Korea, Afghanistan, and even millions within the good 'ol USA are starving daily and have been for some time! What is it you imagine that makes you unique that you should be rescued? Ah, it is your pain that you resent. You should be rescued, but all these other poor souls that are afflicted daily around the world, somehow this is not a problem. Tornadoes rip people from their homes in the middle of the night, throwing babies into trees and giving the survivors nightmares for the rest of their lives. Through all of these complaints that benign aliens should rescue mankind from the pending pole shift, there runs a theme. The infant wants to be rescued. If these natural disasters were in the hands of man, they would be demanding that Obama rescue them. But mankind cannot change what Mother Nature is about to bring, so they cannot make these demands of Obama. But someone must do something! The cushy life, the food cleaned and packaged in the grocery store, the clothing hanging just waiting to be purchased, the guaranteed retirement funds, the ready entertainment on TV - all this about to disappear! How can this be a good thing? The infant thinks no further than his immediate comfort, even if wrapping this in a plaint for others. If your concern were for others, you would not be asking for rescue, you would be doing something about starvation around the world, perhaps volunteering to work for the Red Cross locally or overseas. Are you doing that? http://www.dailygalaxy.com/my_weblog/2011/05/mystery-cosmic-rays-zapping-south-pole.html "Cosmic rays zapping the Earth over the South Pole appear to be coming from particular locations, rather than being distributed uniformly across the sky. Cosmic ray "hotspots" have also been seen in the northern skies too, yet there is no source close enough to produce this strange pattern. The mystery remains perplexing because the hotspots must be produced within about 0.03 light years of Earth. Further out, galactic magnetic fields should deflect the particles so much that the hotspots would be smeared out across the sky. But no such sources are known to exist." Comments? Once again we have mankind's presumption of his knowledge of the Universe to be accurate and complete. How long ago was it he was declaring the Earth flat? Cosmic rays are being produced close to Earth from an unknown source. Oh? Mankind does not even have a term for the type of smoldering brown dwarf Planet X represents. To them, a brown dwarf must be as large or larger than Jupiter, gaseous, a failed sun. Other than that, it must be a planet but planets per human astronomers do not produce light as do suns. Since they don't even have a term for an entity like Planet X, they can hardly be armed to address the emissions it produces. They are wrong about the source of the cosmic rays, which are coming from Planet X and its vast entourage of dust and debris and moons. They are certainly engaged in tunnel vision regarding the Earth magnetic field, which developed a breach on the south side due to the presence of Planet X. How blind can they be? Perhaps this issue may be of interest. It refers to natural hot springs or natural thermal waters. Many people enjoy bathing or swimming in these rare and healthy waters. But these special spots are an indication of a close proximity between the molten lava and the water under the surface. When getting closer to the hour of the PS, when the lava sloshes and tries to find a way out, it may eventually overheat the water, and the whole spring may then act as a boiler ready to explode. Such an explosion would be capable to displace entire strips of land or entire sections of the mountains in the neighborhood, as if these were mere waves in the sea, maybe in your direction. What criteria should be considered for these special spots? How far should we locate from such dangerous places? Hot spots such as hot springs or geysers should absolutely be avoided during the coming pole shift and treated like a volcano that could potentially erupt. They indicate a thin spot in the rock layers, allowing the magma to come close to the surface. Regardless of whether the hot spot is in a stretch zone or a subduction zone, a rupture allowing magma to escape could occur. In a subduction zone, the rock layers could fold over the thin spot and provide a buffer, but likewise the subduction could force magma up and out. In a stretch zone the pressure could be spread over a large area, so that oozing to the surface is unlikely, but likewise the thin area in the crust could tear, allowing hot magma to bubble to the surface. Be 100 miles away from such areas and only return after the pole shift. There is a lot of flooding that is due simply to heavy rain, some exacerbated by land sinking, and other places where the coastline has definitely sunk. Can you help us sort this out? What is the cause of the unusually heavy rains being experienced in some areas? Rain and flooding from rain has obviously been chosen by heads of state as the prevailing excuse for the Earth changes predicted by ourselves, the Zetas. From Indonesia to the Caribbean to S America reports of rain have been inserted into almost every report of sudden or unusual flooding. In Indonesia the press dutifully inserted the "rain" excuse or found some citizen to quote, and only after several months when rebellion set in they began to say "allegedly rain" and the like. Now the press is reporting how long the water has been standing, finally doing their job. In the Caribbean, islands that are in the zone we predicted would be first hit by the tipping and sinking Caribbean are again blaming rain even when the rain charts show a fraction of an inch as the cause. In S America the horrific flooding in Colombia and western Venezuela and in Brazil where the bending continent is being distorted is again being blamed on rain, which certainly was there to some degree, but the press is avoiding a careful analysis of just where the flooding is occurring. If it occurs in this river valley but not downstream, then the water is being held back in some way by a heaving river bottom. In these matters it is up to the reader to discern, as the press is being leaned on, the editors told what to allow. No speculation! Stick with the conservative answer, the traditional answer, which is rain. Nancy and the ning have done their best trying to sort through the reports to prove the issue, which is a lot of work. It would be even more work to do a historical search of flooding reports, to show a pattern of an increase and tenacity. What is really needed for the world to understand what is happening is for an investigative reporter, or concerned citizen, to poll the sites under water. They could determine how long this has been the case, to determine the depth of the water, and to determine the elevation of the site. Lacking this, it will likely be months before an honest report about the flooding in Indonesia comes out, as was the case in Pakistan in the Indus Valley when they lost a mere 10 feet in elevation. The truth may come out in incidental comments, as the Earth changes increase and move to S America and Africa, where the Earth changes will be harder to burry under the rain excuse. This video shows a notebank of the Swiss franc, in which there is Euler and the solar system with a body with an elliptical orbit. Can this be Planet X? Knowledge is power and great wealth buys secrets, as few can resist the immense payments proffered. The artisan who designed the franc did not expect to be discovered! Who could imagine that ZetaTalk would arrive to announce the arrival of Planet X in 2003, when the establishment was desperately covering it up. Who would imagine that ZetaTalk would insist that the Earth had stopped in her orbit, and revealed her anticipated orbital position at the time of the pole shift. The artisan was smug in his knowledge, flaunting it, secretly smirking every time he saw this information appearing in plain sight. Of course, once out, it could not be withdrawn without questions being raised, so it was left in place. Does the Puppet Master know the timing of the pole shift? The timing is known by no man, nor was it provided by the Annunaki, as the slow creep of Planet X past the Sun can encounter many obstacles. The path is certain, the timing is not! I was wondering if flooding in general and in the New Madrid and Wabash Valley fault zones in particular could add stress to those areas affected in the form of weight and pressure. Excessive water could also add lubrication to plates and faults. Could severe and sustained flooding ad to or accelerate preshift adjustments? The water in the soils would probably intensify liquifaction even in areas not directly under water. Water lubricating fault zones to then cause a quake is a fallacy. No documentation to prove the theory has ever been provided because any case where a quake occurred after rain is countered by another case where rain and flooding were absent. This may become an attempt to blame the rain or flooding for Earth changes that are pending, for instance the New Madrid zone quakes. To avoid talking about the presence of Planet X, and to spread disinformation on any pending pole shift cause, the establishment promoted the heavy ice theory. Supposedly, periodically crustal shifts have happened in the past because ice forms on the poles, and this gets heavy, so the globe falls over! We have explained that the weight of ice is counterbalanced by the weight of water at the Equator, pulled there by centrifugal force. In like manner, the weight of water does not trip the balance on the grip that rock fingers have on one another along fault zones. Compared to the weight or rock, or the force needed to move rock layers, the water weight is infinitesimal! Can Zetas say anything about this new formation in Netherlands ? Is it some kind of Planet X position for now? This design is clearly showing the Dark Twin during the passage. The Dark Twin is shown opposite the Earth, identified not only by being on the opposite side of the Sun but by the counterclockwise orbit direction that they both assume. In this diagram, Planet X is shown entering from the lower right, moving slowly past the Sun and doing dual 270 degree rolls. We have mentioned that the Dark Twin is caught in the cup with the Earth and Venus, but that both will escape prior to the pole shift. We have also mentioned that the Dark Twin has moved outside of the orbit he shares with the Earth at this time, to escape the current crowding. In fact, the Dark Twin has been captured on film due to this drift outward. 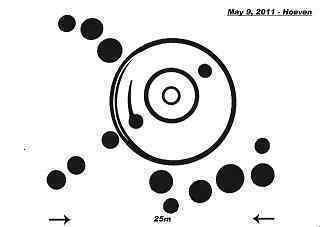 This crop circle diagram is showing the escape of the Dark Twin, which will escape in the manner depicted! After moving directly behind the Earth as Planet X approaches, it will seem to disappear into the night sky. From which direction will the fire storm, the meteorite attack Japan? During the week of rotation stoppage, when firestorms and debris in the tail are at their worst, the direction of the wind will be based primarily upon temperature differences between the land and the oceans. Winds will be based on heating and cooling of the air masses over of the land beneath them. The Coriolis effect will be absent, due to the lack of rotation the week before the pole shift. Japan will be on the dark side of the Earth, and thus will lack the warming influence of the Sun. If the pole shift is occurring during Winter, the winds will come from the Pacific, which remains warmer overall than the land over China. If the pole shift is occurring during Summer, the opposite will be the case, with the winds coming from China. Thus without a timeline, it is not possible to predict the direction of your winds, which will be blowing debris and firestorms over Japan. Prepare for either advent. Any comments about the recently announced Personal Localized Alerting Network plan? Is this connected to unstated, behind-the-scenes planning for the New Madrid and West Coast adjustments? [and from another] http://www.rawstory.com/rs/2011/05/11/us-alert-system-targets-mobile-phones/ Plans were unveiled for a nationwide system that will deliver text-like emergency messages from President Barack Obama and key government agencies to mobile phone users. The free service, called the Personal Localized Alerting Network or "PLAN," is scheduled to be available in New York by the end of this year and throughout the United States by April 2012. Urgent messages about terrorist threats, natural disasters, and other emergency events will be sent through participating carriers AT&T, Sprint, T-Mobile and Verizon, to enabled mobile devices. This is intended to be a nation-wide service available primarily to those citizens who have had to leave their homes due to a disaster. With such a network, it is hoped, government on all levels will find it easier to direct citizens to survival camps, the safe road to use when migrating or traveling, and what areas to avoid for whatever reason. This would, presumably, cover earthquake, volcanic eruption, highway and bridge upheaval and outage, and wildfires. If a survival camp has filled up and another opened nearby, this information could be relayed, for instance. It is presumed that mobile phones will be in operation, and likely some will be throughout the pending New Madrid quakes and adjustments on the West Coast. It is presumed that where all citizens would not have a mobile phone, someone in the crowd would, and would relay the message. Not a bad plan.